These little ghosts are actually Wilton royal icing decorations….I couldn’t resist them, they’re so cute holding their little pieces of candy corn! If you had the time and the patience, these little ghosts could definitely be made from soap, but I didn’t have either this weekend (time or patience!) and I wanted to squeeze in one more Halloween CP soap before it was too late. This soap is made with a standard oo/co/palm recipe, but I did use 1% beeswax in this batch because I have seen beeswax recommended to prevent ash, and I wanted to see if it will work. I usually use rubbing alcohol to keep the ash away and while it works well, I can’t spray it on certain glitters or candies because it causes them to bleed or discolour. I’m not a big fan of using beeswax though; it takes a long time to melt and takes even longer to clean off the dishes. I spooned in the bottom and top layers and swirled the middle layer. I was going for more of a pronounced purple color in the top layer, but it seems to have faded to grey. I also just noticed that the bottom layer looks a little bit like a jack o’lantern face, I couldn't do that again if I tried! I fragranced this soap with Fruity Rings (which smells just like Fruit Loops cereal) from Nature’s Garden. OMG I just love this Halloween soap!!!! P.S. : Are you maybe interested to share 1 or 2 soaps with me? You could choose free between my soaps, the most are in stock. Super Halloween soap!!! The colors are perfect and I love the little ghosts. 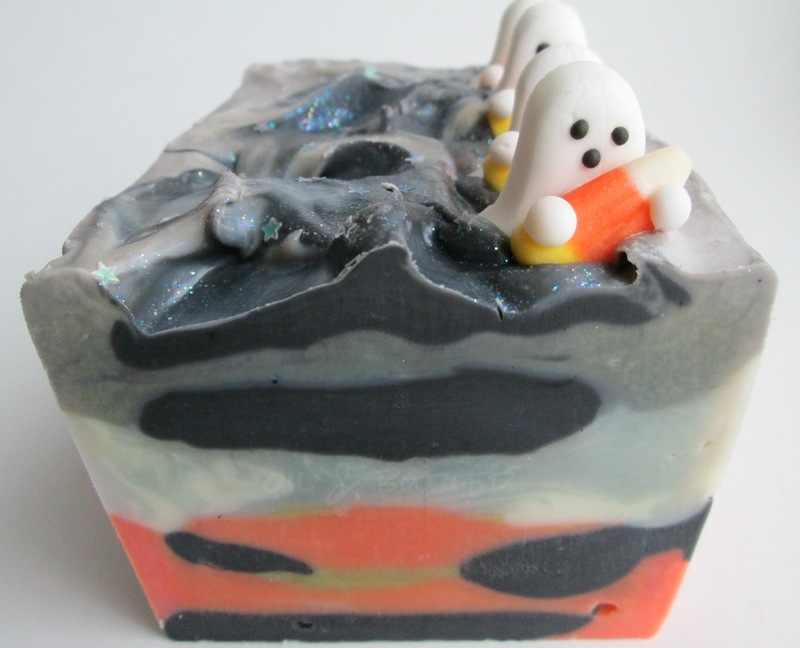 This is such a cute Halloween soap, Cee Gee! I love the little ghosts holding the candy corn. The colors and swirls are great, too. Great colours,Cee! Does this black (is it pigment or activated charcoal,or mica?) bleed into the lather making it black,too? I've used both,charcoal and pigment dispersion,but in smaller portions. This soap just fits its occasion,it's 'spooky' beautiful! Thanks Maja! I tried a little piece just now and the black doesn't seem to be bleeding, which surprises me! This is a funny soap, Cee! The little ghosts are so sweet and the colours fit so well! I didn't know beeswax is recommended to prevent ash, I use it sometimes because it makes the soap harder(in case I use more liquid oils). Thanks Natalia! Do you notice that the beeswax makes the bars last longer too? The beeswax seems to be working...I don't have any ash yet, and normally the bars would have ash by now. So adorable! Looks like they are coming up out of cute little graves! This is so beautiful! Very creative! Love It! adorable as usual! :) love the little ghosts holding the candy corn..too cute! So cute, I really like it. Grate job Cee! Such a great looking soap! Soooo.....Cute!